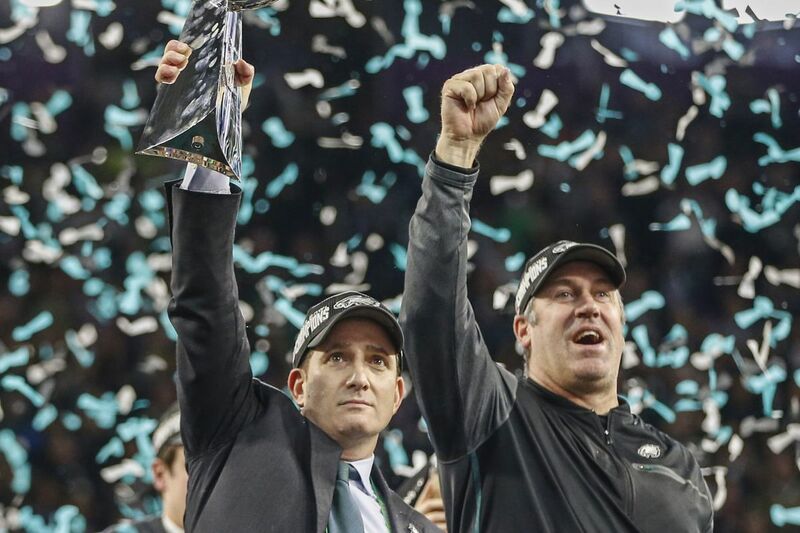 Eagles vice president Howie Roseman, left, and head coach Doug Pederson, right, celebrating on the victory platform with the Lombardi Trophy at the Super Bowl, in Minneapolis. It's been about a month since the Eagles defeated the New England Patriots for their first Super Bowl win, but with a very Philly puzzle answer on Wheel of Fortune last night, the win feels a little more real. The show celebrated the Birds' Super Bowl triumph in its first round Monday night, putting up a puzzle with the answer "Philadelphia Eagles are Super Bowl champions." Though, it took contestants a little while to get there. The "strange round," as host Pat Sajak called it, featured bankrupts on multiple contestants. Ultimately, though, contestant Aymila guessed the Eagles-themed answer to the puzzle to win the round. The Wheel of Fortune puzzle is the latest big shoutout for the Eagles. Over the weekend, Home Alone star Macaulay Culkin joked that the Eagles should have won "best score" at this year's Academy Awards (The Shape of Water won).